Cybersecurity experts recommend that smartphone owners take a number of steps to keep their mobile devices safe and secure. These include using a pass code to gain access to the phone, as well as regularly updating a phone’s apps and operating system. Many Americans, however, are not adhering to these best practices, according to a Pew Research Center report released earlier this year. 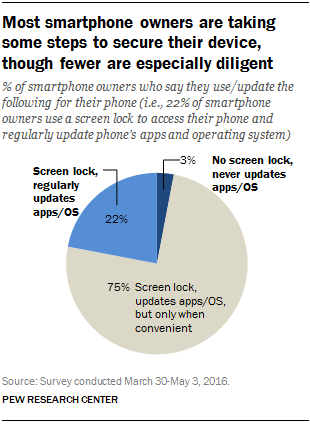 More than a quarter (28%) of smartphone owners say they do not use a screen lock or other security features to access their phone. And while a majority of smartphone users say they have updated their phone’s apps or operating system, about 40% say they only update when it’s convenient for them. Meanwhile, some users forgo updating their phones altogether: Around one-in-ten smartphone owners report they never update their phone’s operating system (14%) or update the apps on their phone (10%). The security of mobile phones has drawn new attention following disclosures by WikiLeaks that the CIA reportedly has the capability to hack into some devices and bypass encryption software. There have also been several high-profile cases of smartphone hacking in recent years. The story around mobile security is not all negative. Very few smartphone owners (3%) say they never update their phone’s apps or operating system or use a screen lock to access their phone. And some users are especially diligent when it comes to mobile security, taking the steps most recommended by cybersecurity experts. Around one-in-five smartphone owners (22%), for example, say they use a screen lock for their phone, update their apps either automatically or as soon as an update is available, and immediately update their device’s operating system when a new version is offered. But most users (75%) fall in the middle of the mobile security spectrum. This group includes smartphone owners who use a screen lock but, unlike more diligent users, only update their phone’s apps and operating system when it’s convenient for them to do so. Mobile technology has given users the ability to conduct a wide range of tasks on the go. But this connectivity also has the potential to expose users to a number of cybersecurity threats. For example, experts note that network connections, such as those found at cafes or airports, could potentially put user data and information at risk. The Pew Research Center survey finds that 54% of internet users use public Wi-Fi networks, and many of these users are performing sensitive activities such online shopping (21%) or online banking (20%).